A great way to use up a glut of homegrown green tomatoes is in the form of chutney. Chutney goes with cheese, sandwiches, cold meat, in burgers, with dinner...the options are endless. It can store really well too if it is prepared and sealed correctly. 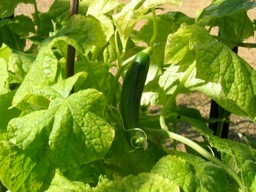 That way you can use your harvest throughout the year and even into next year. This makes around 7-10 medium sized jars. · I prefer a bit of spice in chutneys so I added a little ground ginger and paprika also. Slice your onions and washed green tomatoes, cutting out any bad bits. Add to a large bowl and stir. Add the 4 teaspoons of salt, stir again and then cover with food wrap or a large plate and leave overnight. 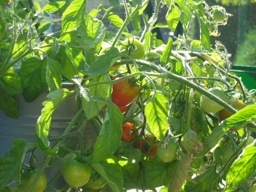 (Make sure you do this as it draws out the excess water from the tomatoes). Once left overnight, Place the litre of vinegar into a large pan. Add the 500g of light brown soft sugar and stir over a medium heat until all the sugar has dissolved and bring to the boil. Roughly chop Sultanas and add them to the vinegar. Bring to a gentle boil. Drain the Tomato and Onion mixture (do not rinse!) and add to the vinegar mixture. Then add the pepper and any chosen spices you wish to add. Stir. Once all the ingredients are in the pot, gently boil for 1-2 hours (stirring every now and then so it doesn't burn to the bottom) , until the chutney has thickened and has a golden appearance in colour. You will know that it is definitely done when you drag a wooden spoon down the middle of the chutney and you can see the bottom of the pan for at least 5-10 seconds. Now is the time to get your jars ready and sterilized. Wash your jars thoroughly with hot water and soap. Then set your oven to a medium heat and place jars upside down in the oven for 5 minutes. They will be HOT to handle after five minutes so ensure you are wearing oven gloves. Spoon the chutney into the sterilized jars (or use a jam funnel if you have one) and place two layers of cling film over the top of the jars (this acts as a seal). Allow to cool, add sticky labels saying what’s in the jar and when it was made, and place the lid on top. You can either eat the Chutney now or allow the flavours to mature for a week or so. Now I have been so busy with work over the past few weeks that I have slightly neglected the garden - thankfully we now have some rain in East Anglia so all my veggies have been growing away happily on their own! I have remembered to water the tomatoes and cucumbers in the greenhouse though and am now being rewarded with lots of flowers and the beginnings of fruit. The Tenderstem Broccoli is also coming along well, although I have had to cover it with mesh netting to stop the slugs and cabbage butterflies and I have already started to harvest small carrots and my fabulous new potatoes, grown in bags this year. One of the reasons for “growing you own” is because the vegetables taste so much better and this is particularly true of these two crops - there is nothing better than digging up your spuds, cooking them straight away and then covering them in butter and a spring of mint before serving! The carrots are so tasty they don’t even make it as far as the pot. Salads are also a great idea at this time of year and if you choose the cut and come again varieties you can have salad leaves on tap whenever you require them. Once other crops have been harvested, salads can easily be sown in the space as they germinate quickly in these sunny/showery conditions and grow quickly - some take as little as three weeks before you can start to eat them. 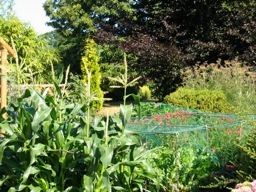 I always grow sweetcorn - again because it is far superior to that which you can buy in the supermarket and this year is no exception -my plants are coming along and will hopefully be ready next month. The same goes for my runner beans - a ‘dead cert’ with my two boys who will eat their own body weight in beans! Have to wait for next month before harvesting though, but it’s nice to know that things are growing and nearly ready to eat. 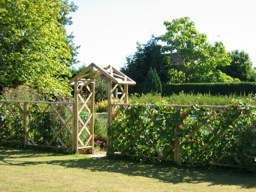 Now is a great time to enjoy the garden as well as work in it, so make sure that you put down your hoe and take some time to relax and enjoy all the hard work you put in months ago by sitting out (when the sunshine prevails) with a cuppa or glass of wine!